Temple of Heaven, originally uploaded by Scott Thomas Photography. Before I learned how to predict when the Blue Hour would happen. I would capture it by accident. When I set up for a classic night photo of the scaled version of the Temple of Heaven in the China pavilion in Epcot’s World Showcase at Walt Disney World, I had no idea I would see a deep blue sky. To me, the sky looked black. Imagine my very pleasant surprise when I reviewed the image on my camera’s LCD screen of the result. I used a tripod to secure the camera with the Nikon 18-200VR lens for 8 seconds at f/8, ISO 200, EV +0.3 and used the widest zoom of 18mm. 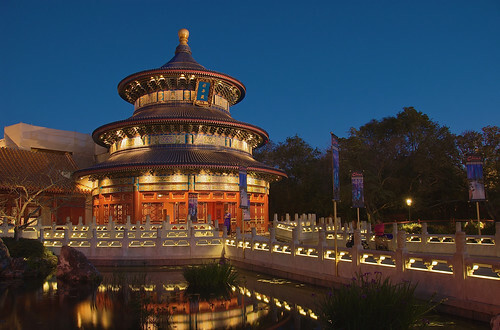 This entry was posted in Travel and tagged blue hour, china, epcot, florida, long exposure, night photography, Photography, temple of heaven, tripod, walt disney world, world showcase. Bookmark the permalink. What a beautifully crisp photo for such low light…. and your lights are not “flare-ing” either so this tells me I have LOT to learn about this type of photography. You are light years ahead of me on this one. You said the magic word, “crisp”. Only way to get a night photo that is crisp and sharp is to use a tripod with remote shutter release, keep the ISO low (100 or 200 depending on your camera), set a small aperture of around f/11 or f/16 and then set the shutter speed for the correct exposure. You’ll be making up those light years in no time, KiwiD! Maybe, but if someone had asked me why this happened and how to do it, I would not have been able to. I can now thanks to the Night Photography eclass I am taking. This shot is amazing! I’m loving all the blue hour photos you’re sharing. I’m inspired to try some more night photography. My question is: what do you set your white balance to? I’m never sure once the sun goes down. I used Auto White Balance here and for the ones on Monday’s post. You should play with others. I tried each white balance setting last week and Tungsten really created a VERY blue photo. Including the shadows! That’s a beautiful shot, the place was not crowded either. I discovered the blue hour (didn’t know at the time) when I was shooting the moon photo. I recalled now that I saw it in the evening and early morning hour. I was there during a low crowd time and it was chilly that night which kept people inside the buildings. Most photographers do “discover” the blue hour by accident. The trick is being able to reproduce photos. That is what Kent teaches in his eclass. Thia is a great shot. I need to go there again since I have been working on my photography skills. I love the lighting in this picture. Did you use any added light at all? No additional light was used. Thanks, Mary! Was not aware of this blue hour. What a nice surprise this must have been! Beautiful exposure & perfect timing! Another awesome shot Scott!